These eland antelope can’t help but look up to the sharp-eyed giraffe, who seems to be striking a managerial pose in honor of National Boss’s Day. An eland is a type of antelope that gathers in herds that can range from 50 to 500 or more, with separate social groups based on gender and age. Herds even form ‘nurseries’ for their young to gather, which sounds like a great perk for working parents. This group was photographed in Etosha National Park, a wildlife reserve in Namibia that’s named for the Etosha Pan–an 1,800-square-mile dry lakebed that’s covered in salt. Feel free to impress your boss with that bit of trivia. The common eland, also known as the southern eland or eland antelope, is a savannah and plains antelope found in East and Southern Africa. It is a species of the family Bovidae and genus Taurotragus. It was first described by Peter Simon Pallas in 1766. An adult male is around 1.6 metres tall at the shoulder and can weigh up to 942 kg with an average of 500–600 kg, 340–445 kg for females. It is the second largest antelope in the world, being slightly smaller on average than the giant eland. 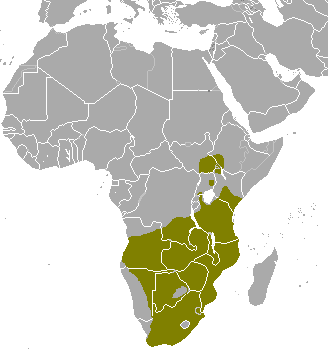 Present range of the common eland (Tragelaphus oryx) according to IUCN SSC Antelope Specialist Group 2008. Tragelaphus oryx. In: IUCN 2011. IUCN Red List of Threatened Species. Version 2011.2. . Downloaded on 05 May 2012.